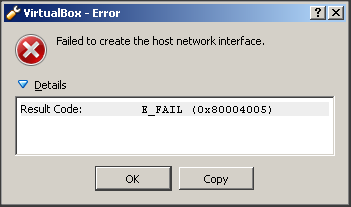 I’m having a problem to install “VirtualBox-4.3.4-91027-Win.exe” in Windows 7 host. Please let me know is there any way to fix this issue. I've installed Virtualbox on three Windows 7 hosts and haven't seen that message. Try a reboot of the host, and try right-clicking the Virtualbox installer and Run As Administrator. On Windows hosts, VirtualBox setup uses a standard MSI installer. I expect it's actually MSI that has a problem with that DLL, and not really VirtualBox - despite the caption that MSI puts on the dialog. Wild guess: MSI wants to install the VBox bridging service onto each NIC present, but for some reason can't until that DLL is unloaded (searching says that this DLL is related to the IPv6-over-IPv4 service of Vista and later). Perhaps it can't unload it because you have an internet browser window open? scottgus1 wrote: I've installed Virtualbox on three Windows 7 hosts and haven't seen that message. 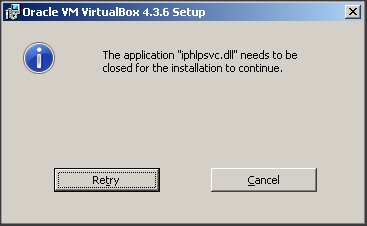 Try a reboot ofthe host, and try right-clicking the Virtualbox installer and Run As Administrator. Thanks scottgus1 for your reply. I've tried that but don’t work. I’ve also downloaded the latest version of virtualbox and reinstall it but don’t work as well. This error message pop up twice, then I clicked ok twice, VirtualBox installed successfully. 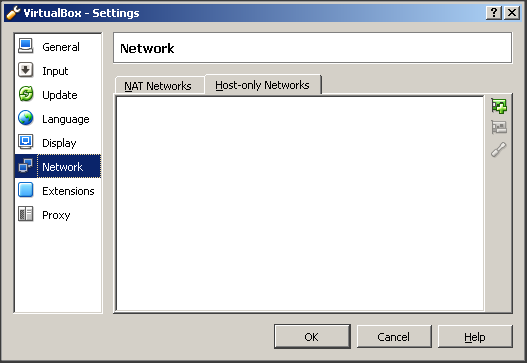 But the problem is I still can’t see the host network interface created on VirtualBox. Normally it will be created automatically. Therefore, I’ve tried to create it manually but was getting the following error. mpack wrote: On Windows hosts, VirtualBox setup uses a standard MSI installer. I expect it's actually MSI that has a problem with that DLL, and not really VirtualBox - despite the caption that MSI puts on the dialog. Thanks mpack for your advice. I’ve been searching in the internet before I post the problem here and found that article related to MSI issue. I’ve also tried that but don’t work too. I’ve closed all the application during the installation but still getting this error message. Even though I managed to install it after clicking OK twice, but the host-network still not created. There is something odd going on here. That DLL will be in every Windows Vista/Win7/Win8 OS and the related service running. What is odd about yours that upsets the installer is really the question. Since it is an IP related service I am not surprised that ignoring the warning results in problems with the host only adapter setup. Just close the IP Helper service before uninstall or install. It should be fine.